Maryann Marino and Steve Samuelian from California Consulting attend the ACCOC, OCBC, and Orange County Hispanic Chamber Holiday Reception - California Consulting, INC.
California Consulting LLC President, Steve Samuelian and Senior Business Development Associate, Maryann Marino, attended the Orange County Business Council, ACCOC, and Orange County Hispanic Chamber Holiday Reception in Irvine. It was attended by more than 300 local elected officials, business leaders, and others throughout orange county. 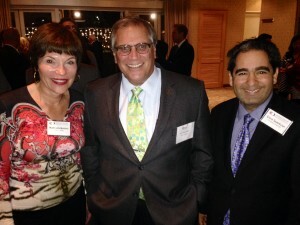 Pictured : Maryann Marino, Mike Ellzey, President and CEO, Nixon Library, and Steve Samuelian.